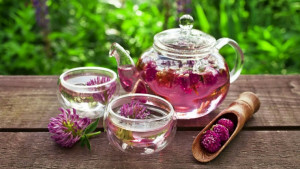 This all-around wellness herb and blood purifier is a key ingredient in herbal blends popularized during the early 1900’s and used in cancer treatment, including Essiac, Dr. Christopher’s Red Clover Combination, and the Hoxsey formula. Red clover has been an Old World symbol for luck and abundance since ancient times. And when it arrived in America with the colonists, its use quickly spread among American Indian tribes. This stout clover has deep pink – not red – plump, round flower heads that contain numerous, small, pea-type flowers above a three-leaved bract. The leaves are marked with a single pale chevron. The lax stems trail up to 2 feet, creating a soft green mass.